The Ingenico IWL252 is a robust and compact Bluetooth card machine that offers some great security features. This Ingenico Bluetooth card machine is great for the hospitality and leisure industry as it can be easily taken to your customer for payments. This great little machine can be used up to one hundred meters away from the base unit and uses Bluetooth technology to connect a customer with their bank from where they are located. What’s more, it will allow you to take an average of 650 transactions on average on each charge. Ingenico IWL252 Bluetooth card machine meets the highest security requirements and is PCI PTS 2.x and 3.x certified with SRED & Open protocol modules. 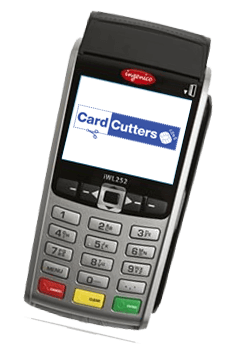 Ingenico IWL252 Bluetooth card machine accepts EMV chip & PIN, magstripe and NFC/contactless, as well as enables new NFC couponing and e-wallets. The Ingenico IWL252 Bluetooth card machine is a small and light electronic payment device. Designed specifically for mobility, the IWL252 provides extended battery life, in a lightweight, robust, compact-sized design and features a wide backlit keypad for outstanding display readability inside or outdoors. Anticipating active use in remote environments, Ingenico Group focused on delivering outstanding battery life. In most cases, the IWL252 is designed to run all day in the most active retail environments. Featuring a complete portfolio with multiple wireless connectivity options – GPRS, 3G, Wi-Fi & Bluetooth Class 1– the iWL Series delivers enhanced network quality of service. Smooth integration of the IWL252 into multi-device solutions is ensured. The IWL252 30-lines-per-second printer is one of the fastest on the market, for on-the-spot checkout efficiency. Optimise revenue opportunities with 24/7 wireless connectivity. Reinvent mobile payment using a compact-sized device with a long-life battery and fast printer. Bring wireless mobile payment to your point of sale (POS). Discover a wide range of POS solutions for small merchants, hospitality, and mobile businesses. We are able to offer both Ingenico and Spire Countertop Card Machines – ask us which is best for your business.